Kathrina Feigh, 24, was born in the Philippines. When Feigh was 9, she moved to Los Angeles with her family. Feigh discovered ways to channel her emotions through music and theater. Now, Feigh is a college graduate with a degree in musical theater. Kathrina Feigh sang an acoustic cover of Jessie J’s “Big White Room”. Today, this performance has 1M YouTube views. Feigh’s effortless vocal runs shined throughout the performance. Jennifer Hudson said that Feigh’s voice and vibrato is amazing. Hudson added that Feigh “has the voice”, which is why she had to turn around. Then Feigh expressed that she is a Jennifer Hudson fan. Feigh also mentioned that she saw Hudson’s Broadway performance in The Color Purple. Musically, Blake Shelton felt that Feigh’s voice is versatile and could cover a very broad spectrum. Shelton added that Feigh’s raspiness attracted him to her music. Kathrina Feigh chose to be on Team Jennifer. 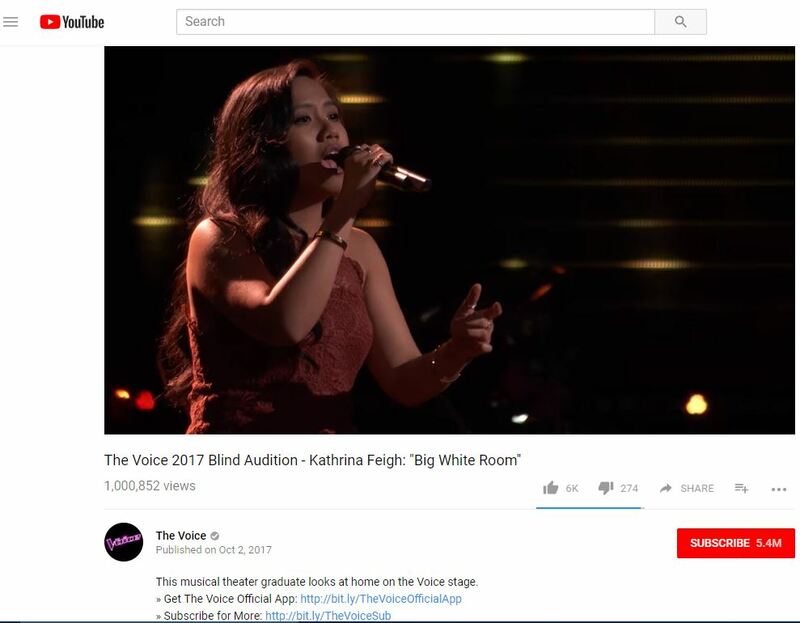 Kathrina Feigh will be featured in The Voice‘s battle rounds.